When a broken man arrives in town desperate to locate his missing girlfriend, loved-up PI Lexi Graves is determined to reunite the lost loves. However, the further Lexi delves into the case, the more it appears that the missing woman doesn’t want to be found. To make matters worse, just as Lexi and her boss slash boyfriend are enjoying a romantic date, their restaurant is targeted by a pair of thieves. 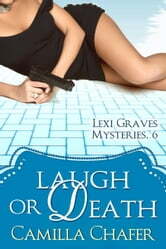 When Lily’s bar falls prey to the gang too, and Lily has a hunch about who’s behind it, Lexi knows she has to help her friend solve the case. Between stakeouts and shootouts, and determined that true love wins out, Lexi redoubles her efforts, enlisting her friends and family network to bring the lost lovers together once more, and the thieves their rightful comeuppance. But just as Lexi is closing in, a frightening twist plunges her into the most dangerous situation she has ever faced.